We’re often told that you should never eat anything (or put anything on your body) if you don’t recognize everything on the ingredients list. But since most of us have no idea what xanthan gum or potassium benzoate are — or more importantly, what they’re doing to our bodies — we’re decoding the ingredients in the many things Americans put in (and on) themselves with the help of an expert. 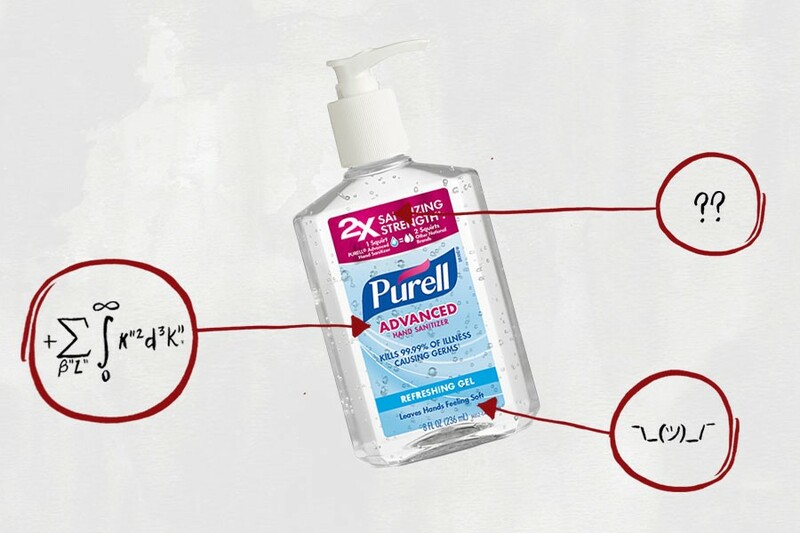 This edition: Purell Advanced Hand Sanitizer, which is made from 10 separate ingredients that we’ve broken down in the exact order they appear on their website. 1) Ethyl Alcohol: Ethyl alcohol is the only active ingredient in this hand sanitizer, and it’s responsible for killing any bacteria that may be lingering on your hands. It’s also the intoxicating ingredient in most forms of booze, meaning you can technically get drunk by consuming hand sanitizer, but it should go without saying that this is a terrible idea: Since hand sanitizer contains extremely strong concentrations of ethyl alcohol — 70 percent, in this case — ingesting it can lead to alcohol poisoning and even death. People still do it, though: This New York Times article features a Wells Fargo banker who drank at least one bottle of hand sanitizer per day in order to cope with the stress that came with working at the bank. 2) Water: You know this one. 3) Isopropyl Alcohol: Isopropyl alcohol is another name for rubbing alcohol, which is also capable of killing bacteria. This ingredient is also probably added to make hand sanitizer deliberately unpalatable (something the government insists is done to all not-for-consumption alcohol to prevent people from making booze out of it). 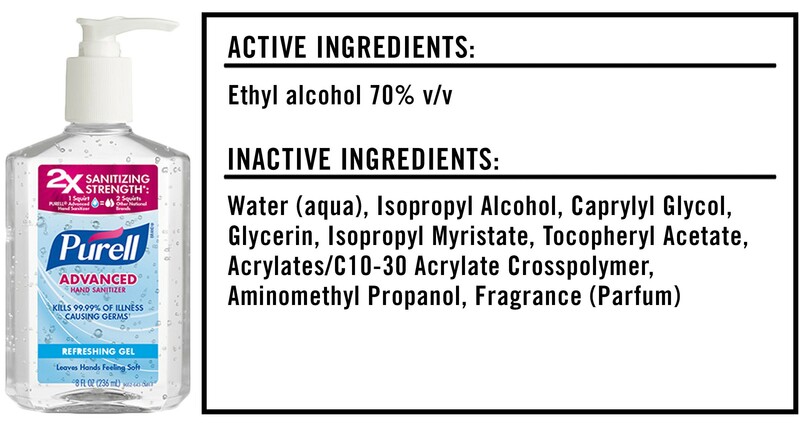 4) Caprylyl Glycol: Caprylyl glycol is “an alcohol derived from caprylic acid, which can be synthetic or sourced from coconut or palm oil,” according to Dagan Xavier, ingredient expert and co-founder of Label Insight. It can be used both as an antimicrobial ingredient to prevent the growth of mold and as a humectant, which as we learned in our exploration of the 10 ingredients in strawberry-flavored lube, acts similar to a moisturizer. 5) Glycerin: Glycerin is often used as a thickening agent or humectant, which keeps moisture in the skin by reducing water loss. 6) Isopropyl Myristate: This ingredient is a skin-conditioning agent that can be synthetically made or sourced from myristic acid (a naturally-occurring fatty acid). It’s particularly good at reducing the greasy feel caused by high oil content in a product, and it’s generally considered to be safe. But people with oily skin beware: It tends to cause blackheads by blocking the pores. 7) Tocopheryl Acetate: This ingredient is a vitamin E supplement derived from vegetable oils, according to Xavier. Vitamin E acts as an antioxidant that helps reduce sun damage. Bonus fact: Recent studies on mice found that tocopheryl acetate may also reduce the effects of cigarette smoke on fetuses in the womb. 8) Acrylates/C10–30 Acrylate Crosspolymer: This insane-sounding ingredient is usually used to improve the texture of skin-care products by helping to combine the water and oil in them. 9) Aminomethyl Propanol: An acidity regulator that keeps products fresh by inhibiting corrosion of the can, container or dispenser. “It can irritate some people’s eyes, skin and lungs,” naturopathic physician Jennifer Stagg told me during our analysis of the ingredients in insect repellent. But so long as you avoid putting this hand sanitizer on your face or sensitive areas, you should be A-okay. 10) Fragrance: This is added to make the product smell nice (obviously). Generally speaking, fragrances can cause skin irritation in those with sensitive skin. While it can be said that, in most cases, soap is a better alternative to hand sanitizer — because hand sanitizer kills both the good and bad bacteria — this product does what it’s supposed to, and is totally safe… so long as you don’t drink it.